Last Friday Night Pizza Night, I shared with you a poem I wrote to my pizza stone. You probably thought I was a bit addled. Correct! In the interest of adding value to the post, I also shared my Roasted Garlic and Herb pizza dough, a dough that I think is not a copycat but better than Trader Joes Garlic Herb Pizza dough. 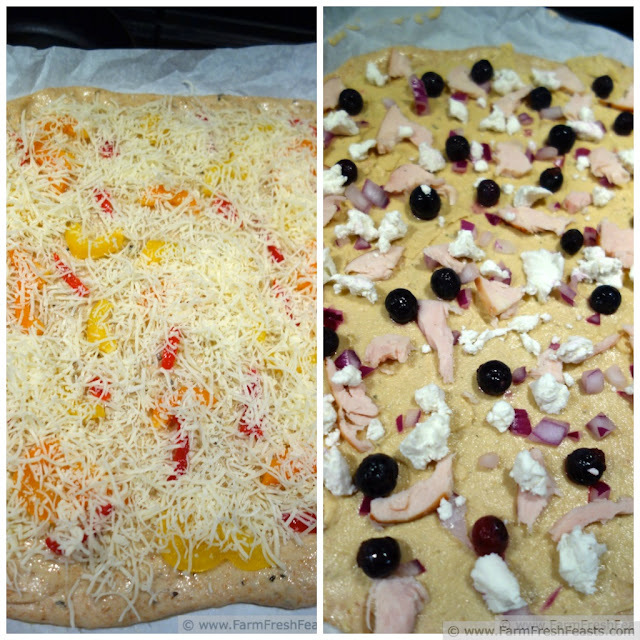 The pizza on the left has hummus, chicken, blueberries, goat cheese and red onion. The pizza on the right has colorful bell peppers and Peppadew peppers. Totally not clear to me if I need to put a ® or ™ symbol with that, so there they are if necessary. I thought I would choose one to share today. I try to balance meat-including pizzas with suitable-for-vegetarian pizzas, but to be perfectly frank, I've been kinda distracted lately. My spouse is embarking on his Asian/Greater Middle East adventure du jour d'année, my kids each had a concert to perform, and we were fortunate to have both grandmas and my dad in attendance which means I've had company for 4+ days. So instead of writing up all about a pizza, with links all around, I've just realized that Friday's blog post should go live in 6 hours and I've not written spit! This is not my usual M.O.. (should there be a 2 punctuation marks there?) Normally I write it all out in longhand, research where I want to link to, type it up, and days/weeks/months later, the night before it goes live, I double check everything and hit publish. And I'm drinking tea while I write, not hard cider while I type. Imagine my surprise when I realize that I don't have a pre-written pizza post at 8 pm on Thursday night! I do, however, have great kids--one's walking the dog, the other is cleaning up from dinner, so I can grab my photos and dump out the contents of my brain so that you've got a pizza inspiration. Some day I'll share about the lovely man at the fancy cheese counter who gave me a sample of Peppadew peppers, thereby inspiring me to actually purchase some Peppadew peppers to have on hand for this pizza. Another time I'll share about the inspiration for this pizza, Heather's Strange But Good flatbread. But after I finish typing this, since I've been up visiting until midnight for several nights in a row, stick a fork in me--I'm done. If you have a hankering for pizza and do eat meat, grab some blueberries, hummus, goat cheese, chicken and red onion and make the pizza on the right. If you're not into meat (these days), grab some bell peppers and Peppadews (Peppadews? is that even a word?) and make the one on the left. As always, please check out my Pizza Primer for really well-thought out not off-the-cuff-hard-cider-influenced pizza making instructions. Guess what? My folks' flight is now delayed, they are heading back here to spend the night, so perhaps Mom will proofread--she's great at that--and this post will be better tomorrow after an update. Preheat oven to 425 degrees Fahrenheit. I love my pizza stone, and I sincerely recommend you scout out a stone at thrift shops. It's a pretty useful item. Preheat yours if you've got one, or use a cookie sheet if you don't. Yet. On an oiled piece of parchment paper, stretch out the dough in the shape you feel like. I did the veggie one a bit too thin this time. It's ok. The family is forgiving, the food is edible, and we're blessed. If you're making the veggie pizza, brush the crust with olive oil, then top with the pepper slices and Peppadew bits. Scatter cheese across the top. If you're making the funky chicken hummus blueberry pizza, spread a layer of hummus over the dough, then top with blueberries, chicken, goat cheese bits, and red onion. Either way, slide the parchment paper and crust into the preheated oven and bake for 5-8 minutes. Then shimmy the parchment out from underneath the crust, and bake an additional 3-5 minutes, until the shredded cheese (veggie) pizza is bubbly or the goat cheese (chicken) pizza is browned. Slice with a handy dandy Zyliss Pizza Wheel and enjoy! And have some hard cider. I'm enjoying a Woodchuck variety pack this weekend, though if I were a cocktail drinker I'd be checking out Stewart's, Lauren's, or Dara's creations which seem perfect for this time of year. NOTE: Homemade hummus? Try Lydia's Roasted Asparagus Hummus, Annemarie's Roasted Tomato Hummus, or Maria's Edamame Basil Hummus to get you started. This post is shared with the From The Farm Blog Hop, the Clever Chicks Blog Hop, the Wednesday Fresh Foods Link Up, What's Cookin' Wednesday, What's In The Box, and Strange But Good at Sprint2TheTable. 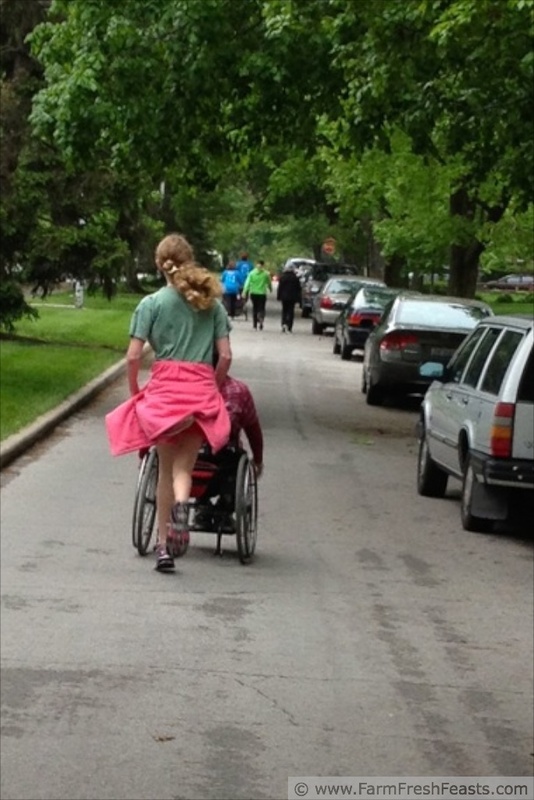 My daughter jogging behind my son, about 3 miles into a 5K the other weekend. Nothing to do with a pizza, but my concert photos are still in the camera, so enjoy this one instead. I vote for the bluebrry-goat chees epizza!!! That sweet and savory combo sounds delish! Thanks for hosting your link party--I'm so inspired! Sounds like a hectic but enjoyable time. Glad you got to see your family! The pizza sounds lovely and I love that plate! I'm a big Polish pottery fan, so thanks for noticing the plate. 3 thinks,,,,,Your pizza dough sounds awesome, love me some peppadew peppers and if it ain't broke(or I should say, still works), why fix it. Both pizzas sound delish! Peppadew peppers have such a neat combination of flavors, I was very glad the fancy cheese counter guy suggested I try them. I suppose I should say fancy cheese counter/olive--and other things--bar guy. 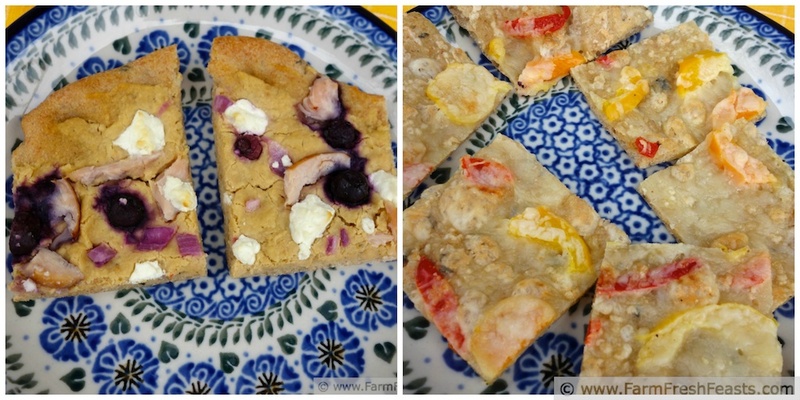 Blueberries on pizza – never thought of it, might just do it. Your pizza posts are always an inspiration! I'm glad for the opportunity to inspire you--I never would have made my own hamburger buns without your post. I love the intro..."You probably thought I was a bit addled. Correct!" You got me laughing right off the bat, and if you weren't addled before, you probably are now after all the houseguests. These are most definitely some creative ingredients. Strange but good for the win. 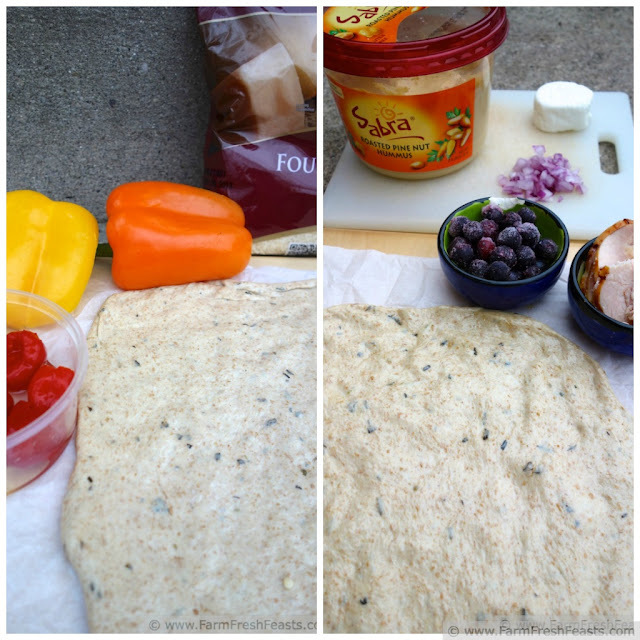 I am loving the blueberry hummus one, although the peppadew peppers doesn't sound too shabby either. You've got some serious skills. Your creativity is endless...blueberry pizza? I need this in my life STAT! I am sure there's an end. I just haven't found it yet! There's too much inspiration all around me.